Welcome back to our native wildflower walk in the deep woods of early summer. If you are just joining us, you may wish to read last week's ezine first. But you don't have to. You can jump in right now, right here and enjoy the walk. Follow me over this wall, around the fallen oak, and past the small quarry pond and we'll soon come to my secret patch of dwarf ginseng (Panax trifolius), [photo 12] one of the finest of the many spring tonics that grow here. Where it grows thickly, I'll gently cut off a leaf. Here, have half. Savor it. My mouth waters for this taste in the spring, so I make an annual pilgrimage every May to be with it and nourish myself with its wildness. And right next to it is gold thread (Coptis groenlandica) [photo 13] in bloom. You and I met gold thread some weeks ago, at the right time to harvest its yellow root/rhizome. Now, we need only sit here and let our imagination turn the flowers into fairy lanterns that will light the way to the gala fairy ball. We need no imagination at all to see those strange-looking green leaves as large green umbrellas. That's American mandrake, mayapple (Podophyllum peltatum). [photo 14] The leaves are big enough for an entire family of fairies to shelter under in a thunderstorm. The entire plant is quite poisonous, except for the fruit, the May-apple (which usually ripens in July! ), but once again, the deer always beat me to them. Jump across this little stream and let's explore a swampy area. Lok at this patch of big, vibrantly-green leaves all folded up like fans. That's Indian poke, or false hellebore (Veratrum viride) [photo 15]. Like the mandrake, it is poisonous. Unlike the mandrake, it grows tall, up to eight feet when it is flowering. Stand still and close your eyes. Open your ears. The warblers are back – the myrtle warbler, the palm warbler, the black and white warbler, and the chestnut-sided warbler. Now, inhale. That delicate sweet scent is spicebush (Lindera benzoin) [photo 16] in bloom. All parts of it have been utilized as seasoning for food. The hard berries are similar to cloves, the aromatic leaves, which aren't out yet, are somewhat like bay, and the twigs are spicy, but not peppery. 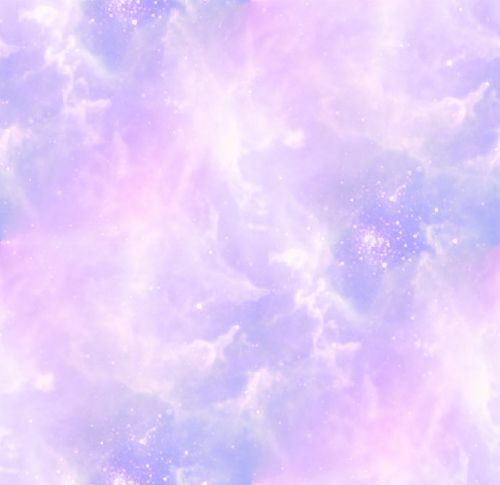 And it is so beautiful. Altogether agreeable, to all the senses. It's only a little further to the river. Let's follow the crows. They're going that way. Along the way we can visit with the dwarf blueberries (Viburnum anfustifolium). [photo 17] Aren't their flowers lovely? Each one will turn into a blueberry, but I've yet to get more than a berry or two to eat, because the deer always beat me to them (and they eat them while they're still green, too). The barberry (Berberis thunbergii) [photo 18] is blooming too. Oh, those fairies have been busy, busy, busy. This is the Japanese barberry – the leaf margins are smooth, not toothed – but all Berberis are useful. The leaves can be eaten in salads. The berries make an excellent conserve. And the bark of the branches and roots contains the important medicinal compound, berberine, an anti-infective alkaloid. What's this? 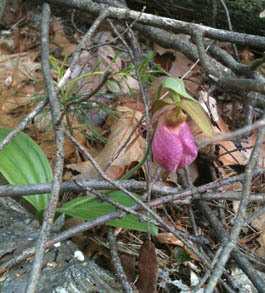 Blooming among the needles between the big white pine and the eastern hemlock? You're right! It's a pink lady slipper orchid (Cypripedium acaule). [photo 20] Like the hepatica we saw earlier, the roots of this rare orchid used to be used medicinally as a nervine, but not now. That's a pileated woodpecker making all that racket. And the chickadees sure are noisy, too. Is something upsetting them. Oh! Look! A red-tailed hawk, circling right above us! And a red flower at our feet. This stunning flower is red trillum, or wake robin (Trillium erectum). [photo 21] The root of this uncommon beauty was once used to help women giving birth since it contains the hormone oxytocin, which encourages uterine contractions. (The drug version is called pitocin.) Note the three green sepals, the three red petals, and the three-part leaf. Surely a plant of the goddess, and herb set aside for women. Let's not disturb her, but be on our way. I've saved the best for last, though it isn't, strictly speaking, a wild flower. At least, not now. It will flower, but later in the year, after the leaves have died. And it is the leaves and bulbs of this plant that interest me. Here, in the seep of this spring, her it is: a beautiful patch of wild leeks (Allium tricoccum) [photo 22], also known as ramps. The smell and taste is stronger than leek, stronger even than garlic. Ramps are delicious cooked and they make a knock-out vinegar. Shall we dig a few to have with our dinner? Thanks for coming on this walk with me. Join me for daily walks in the woods at the Green Witch Intensive coming up this July, or the Green Goddess Apprentice Week in early August . Join the sacred circle of women at the Wise Woman Center for these events, or for a free moonlodge, or a work exchange weekend. Or come see me at the Midwest Women's Herbal Conference. I'll be there soon. I first made this salad with dandelion leaves from the supermarket. Everyone loved it, even children. Then I used wild dandelion leaves. Still tasted great. Then I substituted young, tender plantain leaves, chopped very small. That was so good I began to think I could use any green at all and end up with a yummy salad. creeping jenny leaves and flowers, and even young cronewort. Write and tell us what wild green you used and how your Wild Waldorf turned out. Combine chopped wild leaves, apple, and walnuts. Combine oil, vinegar, honey, and mustard in a small jar, put on lid and shake well. Pour over the salad. Stir well. Add goat cheese and salt. Stir gently. Marinate several hours before serving. Preparation time: About thirty minutes including picking the wild greens. 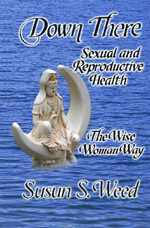 Author: Susun S. Weed Simple, successful, strategies cover the entire range of options -- from mainstream to radical -- to help you choose the best, and the safest, ways to optimize sexual and reproductive health.